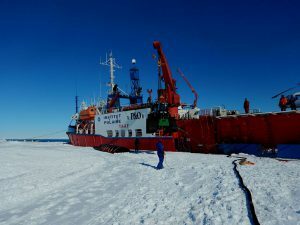 The difficulties posed by the sea ice since 2011 and in particular during the 2013-14 season, when for the first time since the beginning of expeditions to Terre Adelie, the sea ice did not break up with the advent of summer, obliged us to review the whole operational process of the season’s commencement. 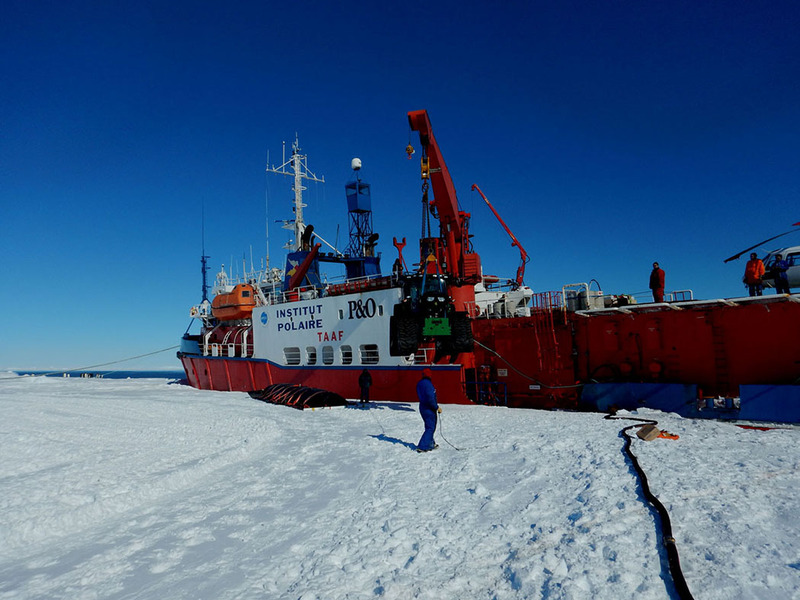 It is perhaps a cliché to recall that fuel is the crux of all our activity in Antarctica. 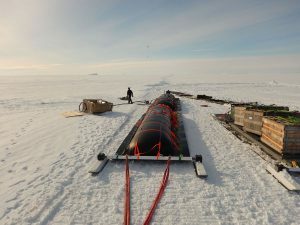 Since fuel deliveries for the 13-14 season only just permitted those wintering at Concordia and Dumont d’Urville to keep going without too may restrictions, for the 2014-15 season it was planned to unload fuel from the October rotation, in particular so that Concordia could be delivered before the end of the year (a minimum of two convoys are necessary to supply Concordia, but for the second to be undertaken, the first convoy must depart prior to 20 December). The technical preparation for this fuel unloading operation covered several hypotheses. Aside from an out-and-out early melt which could have occurred, three approaches were envisaged: unloading by helicopter, unloading onto the sea ice, or unloading at a different point on the coast according to access facilities. According to these 3 hypotheses, the following tooling and specialised equipment was therefore acquired in 2014: flexible 12m3 bladders to be placed on plastics mats (so as to transfer the fuel across the sea ice surface), provisional storage bladders (for a total volume of 260m3) to constitute a provisional depot at another point of the continent, and heliportable 1200 litre bladders, should helicopter transfer need to be undertaken. We prepared ourselves to implement all or part of these solutions. 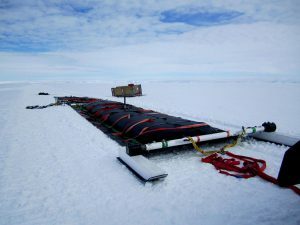 For safety, two specialists – one a continental ice and the other a sea ice specialist, joined the October team in order to detect, respectively, potential crevasses on the new areas we might traverse over the continental glaciers, and in the other case the thickness and faults in the sea ice. 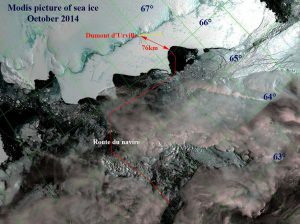 Finally, the ship (Astrolabe I operated by P&O maritime) arrived in the proximity of Dumont d’Urville on 31/10 at 76km from the station. Transfer operations then commenced, alternating with the bad weather days which are numerous at this period. 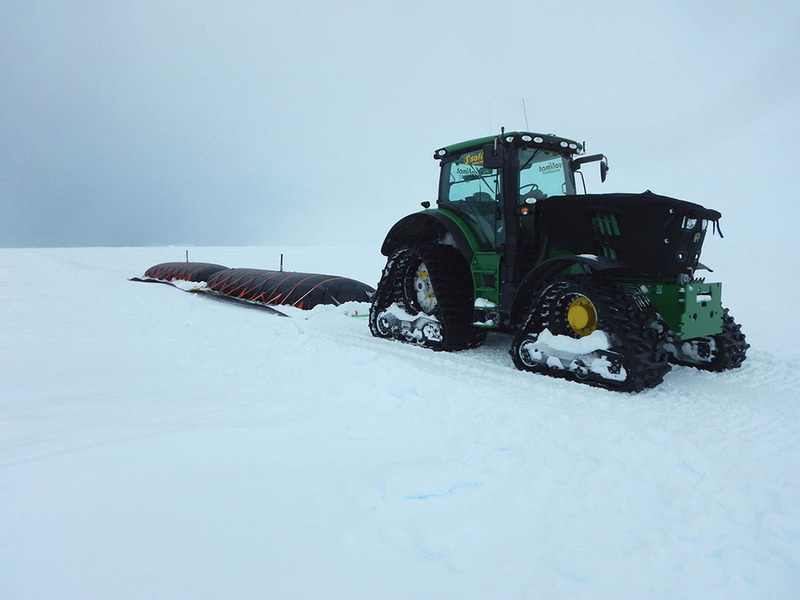 The ice field was located, and the sea ice specialist was able to sound doubtful zones which had been detected previously by helicopter. From the recordings the decision was made on 5 November to unload via the sea ice. After organising the relevant equipment and following a few days of bad weather, the first transfer took place on 09/11. Given the distance, it was decided to create a midway depot half way between the ship and the station (about 35km). Depot transfer operations continued until 18 November, date when all the fuel (305m3) loaded at Hobart was completely transferred. The supply ship set sail north on the 19th November. Subsequently the fuel at the midway depot was transferred to Cape Prudhomme and to the Dumont d’Urville Station. The Astrolabe returned to Hobart on 25/11.